We’d love your help. Let us know what’s wrong with this preview of Ryan's Letters by Jax Jillian. It has been almost eight months since the love of his life, Larkin, passed, and Ryan Boone has tried to make good on his promise to her to keep living. The letters she left behind had helped him tremendously, but all of a sudden, he felt like he was drowning and only she could save him. The only way he could think to reach out to he My dearest Larkin. Help me. I'm drowning. To ask other readers questions about Ryan's Letters, please sign up. Larkin’s letters had me in tears. Now Ryan’s letters has shattered me. The feels from this poignantly written and beautiful book on moving on while feeling guilt over living is just amazing. Ryan is drowning in his grief over losing Larkin. The only thing keeping him going is her letters and his promise to her. One day he reaches a low and this is when his world begins to change again. Larkin comes to him and begins to help him come alive. To try to do as Larkin asks and open his heart and move o Larkin’s letters had me in tears. Now Ryan’s letters has shattered me. The feels from this poignantly written and beautiful book on moving on while feeling guilt over living is just amazing. Ryan is drowning in his grief over losing Larkin. The only thing keeping him going is her letters and his promise to her. One day he reaches a low and this is when his world begins to change again. Larkin comes to him and begins to help him come alive. To try to do as Larkin asks and open his heart and move on, Ryan begins writing these very heartjerking, emotionally draining and shattering letters to Larkin that will just tear your heartstrings. He speaks of his despair and love for her. How he can’t go on and she is all that keeps him going. She starts to visit him to help him cope. Suddenly we not only have this poignant exchange with Ryan and Larkin but now Ryan is dealing with a new neighbor Lux. Lux is lost in her own grief and guilt but is a genuinely nice woman. She is drawn to Ryan as he is to her but he resists. He feels guilty over talking to her because of Larkin. He tries to run but Lux is always there with open arms and heart. Larkin is trying to help Ryan with his guilt and show him it is okay but he is afraid. Afraid Larkin will go away if he gets close to Lux and he feels it is Larkin who is keeping him alive. It’s so sad and yet beautiful the love that Ryan has for Larkin. It is all encompassing. As Ryan and Lux become close, Ryan begins to come alive again. But he is scared of leaving Larkin and disrespecting their love. It is Larkin who helps Ryan to see it is okay to move on and that Lux needs him like he needs her. Larkin helps him realize that their love will always be there surrounding him and that his heart has enough love and room to include another in his life. this is the beautiful, poignant, moving, and amazing story of Ryan and Lux. Of Ryan letting go of his grief and learning to love again. Of him seeing that it is okay to move on and find someone. Of him seeing that Larkin will always be in his heart no matter what. Of Lux dealing with her guilt and fear. Of her finding love and trust with Ryan and her helping him to move on. This is their story and it will have you cry, laugh and smile as you see them find their way out of their guilt and grief and to each other as they find out how to live freely and with love in their lives for each other. Jax Jillian wrote with heart. I felt what Ryan was going through with the lost of his beloved Larkin. The letters were a way of getting through life. With each burned letter, Ryan saw Larkin. Larkin pushed Ryan to live and love. I believed that Jax Jillian wrote a game plan on how to move on with life after the lost of a loved one. This book is a must read and even a reread. The first book Larkin's letters torn my heart out. This book builds your spirit. I didn’t think my heart could be squashed any more that it was with Larkin’s Letters but dang was I wrong. Ryan’s Letters is even more heart torturing. We all know people who have guilt from continuing to live and this story is the picture of just that. Ryan is simply trying to survive the death of his wife. His hope is wavering; his will is fading. He continues to survive on Larkin’s words given to him in her letters. He knows he promised her things but he isn’t sure he can uphold those. Ryan’s world is collapsing and he is done until Larkin comes to him and tells him to open up; to see the world and life he still has ahead of him. Ryan begins to put his thoughts on paper draining his emotions pouring them into you; the reader. Lux has guilt of her own. She is lost as well. Ryan is drawn to her in an odd way but again feels immense guilt. Ryan is terrified of opening himself up and losing Larkin forever. I have no words that can serve this part of the story justice. All I can say is that Im thankful I have never had to deal with such a burden in my personal life. This was numbing sitting back and watching this all take place. You wanted to reach in and tell Lux and Ryan it was going to be okay. How do you balance continuing to love someone who isn’t there so deeply but having your heart start to slowly beat again over someone new? I have no words …..
We know this is fiction but I don’t know .. If I knew someone who was going through something like this I would give both of these books to them and just say … read and Im going to sit here until you are done. What a moving and painfully, absolutely terrific story. This series is not for the faint of heart but it is for the brave of heart. I highly recommend you click Larkin’s Letters and Ryan’s Letters up. These books are not difficult reads as far as the story line but they are gut wrenching but at the same time create a desire to seek out a love so pure and all consuming. 5 magnificent and brutal stars. I was gifted an ARC for an honest review. Thank you Jax! Review to post on Ramblings From Beneath The Sheets. "Larkin, no, please don't leave." "Close your eyes, beautiful boy. I This is the sequel to Larkin's Letters, a book that broke my heart. In this follow-up, we see where Ryan is at in his life and see him struggling to come to terms with Larkin's death months later. He decides to start writing to Larkin, explaining what he's feeling and how much he loves and misses her. He subsequently burns the letters and Larkin begins to appear after each burned letter. He looks forward to the visits with her. This book is absolutely beautiful! This is the follow-up to Larkin's Letters, and if you haven't read that, start there and read these books when you are able to commit to all of the feels and emotions you will undoubtedly experience when you read both of these books. Ryan is doing his best to live up to the promises he made to Larkin, but his grief is still holding him back. And as much as he fights it, he seems to have forged a connection with Lux, who is fighting her own battle against the grie This book is absolutely beautiful! Ryan is doing his best to live up to the promises he made to Larkin, but his grief is still holding him back. And as much as he fights it, he seems to have forged a connection with Lux, who is fighting her own battle against the grief that is threatening to consume her. Ms. Jillian has such a way with words that you can't help but to feel the pain that Ryan is experiencing; how do you go on with life when your soulmate is no longer standing beside you? How do you deal with the guilt of letting someone new into your heart, when your heart hasn't and won't fully heal from the void that's left when your world is irrevocably changed? That question is answered for Ryan and it's surprising who helps him realize that his heart is indeed big enough to be able to love more than one person. I have no adequate words to describe this story, other than to say it is beautifully written and one that will stay with me for a long time. I loved the authors debut book "Larkins Letters". In fact it is one of my all time favorite books and this one will be joining it. This book broke my heart wide open then slowly put it back together again. The author uses words in a manner that engages the readers emotions so intensely that you should have kleenex close by. In this story we visit Ryan months later as he starts to write to Larkin to deal with his pain over her death. His character is believable and your heart breaks for him as he I loved the authors debut book "Larkins Letters". In fact it is one of my all time favorite books and this one will be joining it. In this story we visit Ryan months later as he starts to write to Larkin to deal with his pain over her death. His character is believable and your heart breaks for him as he continues his life after Larkin passes. Lux his new next door neighbor at times seems over sweet and too nice to be true but her character fits well in this story. The story line opens the readers mind to the possibility that those we love who have passed can be there to help us move forward in our grief. This book is not for the faint of heart because in the end you can't help but to be changed and more thoughtful. I give this book 5 STARS and recommend it for everyone. A copy was gifted for an honest review. Oh how I had to put this down a few times... the emotions felt in this book are unbelievable. I just can't imagine what it's like to lose the love of your life.. I needed tissues while reading that for sure.. This is an amazing book, so well thought out and written! Jax Jillian has penned another great book. More review to come. I received an ARC from the author JAX JILLIAN-in exchange for an honest opinion. This is Mismousey's very honest opinion of RYAN'S LETTERS. Now having not read Ms. Jillian's first novel Larkin's Letters-(which I am now gonna have to read). I was unsure of what type of author Ms.Jillian would be. I found out with a few sentences that she is a very emotional one. Ms. Jillian is able to bring so much emotion to her writing & into the story. You are able to feel all the emotions Ryan is going through. The grieving -the anger-love-disappointment-sadness-accepting- and letting go. Ms. Jillian is a very talented author. She brings her characters to life right before your eyes- their emotions -you are able to feel. It is like -it's happening to you. As for the scenes in the story -they are so amazing, and well described & detailed. You feel part of the story and see everything so clearly. Ryan is left letters by his dead wife Larkin. Which he reads, when he goes back to their house on the weekend. Where she passed away. He writes a letter to her -then goes out their favorite place on the dune. Feeds the birds, sets up a bonfire an puts his fishing pole in the water for some night fishing. But he also takes and burns his letter to Larkin. This is weekly tradition. Now he has a new neighbour. Ryan believes that they are sitting on his dune. But he soon learns that it is not her but Larkin. Larkin wants him to open himself to love again. He begins talking to his neighbour Lux -a doctor. Lux is dealing with her own emotional problem. Thinking that moving and starting over would help - she decides to buy a house next door to Ryan. Can they help each other over come their problems? Will Ryan be able to finally let Larkin go? This story is so emotional - you will need plenty of tissue. I do recommend this whole hardly for all readers. Mismousey gives this a firm rating of 80 out of 5 stars. NOW MAKE SURE TO ADD THIS TO YOUR GOODREADS READING LIST!!! AS YOU HAVE TO READ THIS BOOK!! AND MAKE SURE THAT YOU READ LARKIN'S LETTERS ALSO! THEN RUN AND GET YOUR COPY OF THIS TERRIFIC STORY!!! I can't express how much this book has affected me. A man who feels like he can't move on from his wife's absence and just the heartfelt that overwhelmed me and I sincerely felt my heart break for this man to have to feel guilt for living while his wife is gone. Now that is what you call true love right there! Ryan seems to feel lost without Larkin and he has her letters to keep him alive and going with life. He starts writing her letters and pretty much just telling her how he can't go on and she starts appearing on him and helping him to find his strength and continue living on. As Ryan is trying to cope with his grief and having Larking make appearances, he meets his new neighbor Lux who happens to also be in grief herself and they become friends. Although Lux is drawn to Ryan and he is to her, Ryan finds ways to avoid Lux and run from her, she in return is always there for him with open arms. He's afraid that if he moves on with his life he will lose Larkin forever, but Larkin keeps telling him that it's okay to move on and be happy because she wants him to be happy. I was literally in tears with this book. I was sad that he was hurting so bad for the loss of his wife and also sad that he felt like he couldn't move on and be happy because she wasn't there with him to make him happy. Ryan finally starts getting close to Lux and he seems to be more at piece when Larkin tells him that it's okay for him to love Lux and make her happy. Larkin will always be there for him no matter what, their love is strong and he will always love Larkin like Larkin will always love Ryan but it's time for him to move on and be happy with someone else and Lux needs him right now as much as he needs her. This was beautifully written, emotionally sad, heartbreaking and moving story. Two broken people who come together and try and fix each other, cope with their griefs together and move forward and try and make each other happy. This book will have you in sad tears and happy tears. Wow. I must say that for Jax Jillian's debut novels, these were kickers to the emotions. There are two novels in this duet. And they are both equally saddening, and make you want to curl up in a ball, with a blanket, and cry. Rather hysterically, I might add. I was a tad bit confused when I first started reading Larkin's Letters. Nothing bad against the author because I honestly think she meant to lead the reader on the way she did. It was brilliant, if that's the case, and I must say that I had Wow. I must say that for Jax Jillian's debut novels, these were kickers to the emotions. There are two novels in this duet. And they are both equally saddening, and make you want to curl up in a ball, with a blanket, and cry. Rather hysterically, I might add. I was a tad bit confused when I first started reading Larkin's Letters. Nothing bad against the author because I honestly think she meant to lead the reader on the way she did. It was brilliant, if that's the case, and I must say that I had me second guessing if Larkin was really gone. Larkin and Ryan have been best friends since childhood. Larkin's Letters focuses on the letters Larkin has written for Ryan to help him through the pain of losing her. The problem is that Ryan still sees her. And the letters only help for so long before they tear Ryan apart, and cover him in darkness. This entire novel focused on Larkin. Her battle with leukemia, her affair with Ryan, the fact that she knew what she wanted, and couldn't do anything about it because of her already failing, and dwindling health (and marriage from what I gathered). You have to read this novel to really get an understanding of Larkin, where she was coming from, and the pain that Ryan endures to get to Ryan's Letters. Ryan's Letters. Where to begin. The reader meets back up with Ryan in this novel that focuses on his healing after Larkin's passing. When the reader thinks there is no way that Ryan can come back from his loss, he does. Somewhat. Larkin is still present in Ryan's life. He swears he can feel her, and when the new neighbor, Lux moves in, Ryan wants nothing to do with her, and the potential that they could have. Lux is suffering from her own loss, and wants that connection with somebody like Ryan. Does Ryan have what it takes to walk away from what him and Larkin once shared? Ryan promised Larkin he would keep living before she passed away. But Ryan, almost eight months latter, Ryan Boone has tried to make good on his promise to her to keep living. Larkin's letters have helped him get up everyday but he still feeling like he is drowning. Larkin is the only one who can help him move on from her death and keep living. The only way he could think to reach out to her was to write her letters, just like she did to him. Ryan's Letters is the sequel to Jax Jillian's first n Ryan promised Larkin he would keep living before she passed away. But Ryan, almost eight months latter, Ryan Boone has tried to make good on his promise to her to keep living. Larkin's letters have helped him get up everyday but he still feeling like he is drowning. Larkin is the only one who can help him move on from her death and keep living. The only way he could think to reach out to her was to write her letters, just like she did to him. Ryan's Letters is the sequel to Jax Jillian's first novel, Larkin's Letters. Ryan is in a bad place in this book because Larkin's ghost keeps him reliving their past. But when Lux, his new neighbor becomes friends with Ryan. He has to choose between Larkin's "ghost" visit or moving on and truly living with Lux. Ryan and Lux have a connection but will he realize that Larking wanted him to keep living and not take "time" for granted and Larkin believed that moving on was Ryan way of honoring their "time" together. A few years ago I was contacted to review a book that completely floored me. To this day, that book is still one of my all time favorite books, its still the most beautifully written, amazingly tragic book I've ever read, and it was a debut novel. The writing and the story itself are just eloquent. It was also one of the very FEW debut books I have ever given 5 stars to - if I could I would give it 50,000 stars, it deserves them, it deserves to be on every bestseller's list out there and it dese A few years ago I was contacted to review a book that completely floored me. To this day, that book is still one of my all time favorite books, its still the most beautifully written, amazingly tragic book I've ever read, and it was a debut novel. The writing and the story itself are just eloquent. It was also one of the very FEW debut books I have ever given 5 stars to - if I could I would give it 50,000 stars, it deserves them, it deserves to be on every bestseller's list out there and it deserves awards out the wazoo. That book was Larkin's Letters which is the predecessor to Ryan's Letters. Ryan's Letters is just as amazing as Larkin's Letters was. It is just as eloquently written and just as beautifully tragic. Ryan Boone has lost the love of his life, his true soulmate and he is drowning in grief. Just as Larkin wrote to Ryan, Ryan decides to now write to Larkin and in his letters he voices the feelings he keeps hidden from everyone else. When Larkin starts appearing to Ryan reading his letters my heart just broke. I could actually see in my head and feel the love flowing between these two. Through his letters and Larkin's visits, Larkin begins to help Ryan through his grieving and to continue on with his life which includes meeting someone new and learning to also let that person be there for him through his healing. In Ryan's Letters we also get one more of Larkin's letters, one she had written to her parents. This was my favorite letter of the book, it totally caved my heart in but I was so happy for the closure it gave her parents. Get ready to experience another heart wrenching love story. Now is Ryan's turned to make you ugly cry and leave a permanent mark in your heart. Ryan has been trying to survive his day without Larkin and in order to do so he must do anything in is power to stay connected with his beloved wife. It was been hard on him but little did he know Larkin was preparing Ryan to finally move on with his ife and what better way than do bring him Lux his new next door neighbor. Lux is mourning the loss of her brother and the only way to move on was to move away and lands next to Ryan another broken soul mourning the loss of a loved one. But will she be up for the fight of her life trying to rescue Ryan from his lonely world his living since Larkin's death. If you thought Larkin's Letters was an emotional, ugly cry, heart wrenching love story, then get ready to experience it in a deeper dimention. You will be left with a deep meaning of love, peace, loyalty, peace and believing in true love all over again. In order to experience this love story in its glory you must read Larkin's Letters prior to Ryan's. You will fall in love with this incredible, unforgettable books. In this book, Ryan is trying to make good on his promise to Larkin and move on and live his life, but he's drowning in his grief and just cant move on. He decides in order to help Ryan's Letters is the sequel to Larkins Letters, a book that literally tore my heart out. I'm not going to lie I was both eager and apprehensive before I delved back into Ryan's deep emotionally charged journey of his daily struggles in coming to terms with the death of losing the love of his life, his soul mate Larkin. Hurt. Tears. Sobbing. Too many tissues. I never thought I would be utterly crying after reading yet another book by Jax. I should have expected it though since it follows Larkins Letters and that book shattered me, this one has me with no words. The emotions felt throughout this book have left me hollow and wanting to fix something. I had to put it down and regroup before jumping back in. All I can and will say is READ THIS BOOK! the first one too! I never even heard of this author before reading these two books and I am soo really glad that I have read these and I will cherish them always. The writing is great and it pulls you in and you want more from it but then you get blind sided and hit with the hurt and pain. It just made me love it all the more! Being happy that although you may hurt there is always light at the end of the tunnel. Please please read these books! I strongly suggest you read Larkin's Letters before you read this book. Have tissues on hand. Then take a day to let it all sink in, then continue on with Ryan's Letters. This is about everlasting unconditional love. It is about appreciating life and friendship and relationships and family no matter what life throws at you. And it is about continuing to live when you don't remember how. Larkin again steals the story. Her letters reach your heart deeper than any others. Ryan tries to make good on hi I strongly suggest you read Larkin's Letters before you read this book. Ryan tries to make good on his promises. When it seems he begins to move forward, he gets in his own way.Lux has her own baggage. She is looking for a fresh start because she can't continue the way life and guilt are making her feel. Can they help each other or is each lost in their own pain? Another wonderfully written emotional experience from author Jax Jillian. 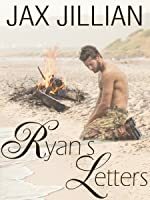 A sequel to Larkin’s Letters, Ryan’s Letters is a certified tearjerker with a HEA (happy ever after) ending. Following the journey of Ryan’s recovery from Larkin’s death, this novel reflects the reality of how difficult it is to let go especially of something that has been a huge part of our lives. Its ghost follows us, not because it wants to haunt us but because we keep looking for it. Moving on is not an instantaneous thing but a slow gradual process that hurts as much as it heals and this bo A sequel to Larkin’s Letters, Ryan’s Letters is a certified tearjerker with a HEA (happy ever after) ending. Following the journey of Ryan’s recovery from Larkin’s death, this novel reflects the reality of how difficult it is to let go especially of something that has been a huge part of our lives. Its ghost follows us, not because it wants to haunt us but because we keep looking for it. Moving on is not an instantaneous thing but a slow gradual process that hurts as much as it heals and this book perfectly reflects that. I recommend this book to those people who have a hard time recovering from a monumental loss or change, then again, that’s everybody. To date, this is one of my favorite series. I was given an e-copy of the book by DRC Promotions. I was not compensated for this review. All conclusions are my own responsibility. This book make you to open your emotions that is so strong that you feel like you could actually be there. We feel the pain of Ryan is feeling with the loss of his wife Larkin. What emotion that we feel when we lose someone so close and love with all your heart. All have a way of getting their trauma of lose in different ways, Ryan way was to write a letter to Larkin and when done burn it to be set free. Can you truly let go of your love and move on, even when that is what they want you to do. T This book make you to open your emotions that is so strong that you feel like you could actually be there. We feel the pain of Ryan is feeling with the loss of his wife Larkin. What emotion that we feel when we lose someone so close and love with all your heart. All have a way of getting their trauma of lose in different ways, Ryan way was to write a letter to Larkin and when done burn it to be set free. Can you truly let go of your love and move on, even when that is what they want you to do. This was a very emotional roller coaster ride of a story. Highly recommend. Just when you think that you couldn't hurt more.. This is the sequel to Larkin's Letters and wow!! Have tissues handy with this one also! Larkin's Letters shredded my heart, this book shattered what was left, but helped to heal it as well. In this part of Ryan's story, We are able to watch him try to learn to live with the love of his life gone.. It is beautifully heart~wrenching. I recommend this series to everyone who loves heart in their books!! An ARC of this ebook was given in exchange for a Just when you think that you couldn't hurt more..
OMG Larkin's letters had me in tears. In this follow up we follow Ryan's journey to get over his wife's death. The problem is each letter he writes to his wife he sees her. When hot new neighbour moves next door. He finds out her name is Lux and she is a Dr. Ryan must choose what he wants in his life. He doesn't want to betray Larkin. Wasn't sure what to expect but was very well spoken story of love loss and love. I bet a lot of ppl wish they could talk to a love they lost. Very good read, loved it! Where Larkin's letters ripped my heart apart, Ryan's letter began to put the pieces back together, even though his first two letters had me crying my eyes out. His letters to Larkin were beautiful and heartbreaking as he poured his soul, his grief, his loneliness, his missing her and his love for her into them. He read the letters she had written to him and tried to take comfort in them, tried to do as she had told him to do and move forward and live his life. But how do you do that? How do you Where Larkin's letters ripped my heart apart, Ryan's letter began to put the pieces back together, even though his first two letters had me crying my eyes out. His letters to Larkin were beautiful and heartbreaking as he poured his soul, his grief, his loneliness, his missing her and his love for her into them. He read the letters she had written to him and tried to take comfort in them, tried to do as she had told him to do and move forward and live his life. But how do you do that? How do you move forward when you heart isn't in it because it left with the one true love of your life. Ryan decides to write to her, and as he did with her ashes, he released each letter he wrote into the flames of a bonfire with the hopes that the ashes would reach her and she would be able to read them. And then she would visit him, giving him the greatest gift she could, some peace. That peace would only last as long as she was with him and when she would leave him, his grief would find him again. She wanted him to move on, to find someone to fill his life, his heart with life and love again. She wanted him to open himself up to Lux, his beautiful new neighbor, who held a grief and tortured soul of her own. They were two people who desperately needed each other, only he didn't see that. But what he could use right now is a friend, someone to help him with his loneliness, and Lux did that. Ryan's Letters takes you through Ryan's grief and his journey to try and find life and love again. It takes you through his pain and his uncertainty of having any kind of relationship with anyone other than Larkin. Through his journey, Larkin helps him to open his heart with her visits to him. She helps him to move on and finally, to let her go. He realizes finally that the greatest gift that Larkin gives him, is Lux. This is a beautifully written story with wonderfully written characters who grab ahold of your heart and embed themselves there and I don't think they will ever leave. A true love story that will stand the test of time. She settled in Jax Jillian was born in Albuquerque, NM but before she turned a year old, her parents moved east to Harrisburg, PA where she was raised. After graduating high school in 1995, Jax attended La Salle University (1999, B.A., Communication), Temple University (2001, M.Ed, Sport & Recreation Administration), and Central Pennsylvania College (2005, A.A.S, Physical Therapist Assistant). Jax is the author of Larkin’s Letters and Ryan’s Letters, two contemporary romance novels that have seen early success from reviewers, with both averaging 4.8/5 stars on Amazon and Goodreads. She just finished writing her fourth novel and aspires to write a screenplay one day.